Lady of Light… and salesmen. Saint Lucy, also known as Saint Lucia, was born in about 283, AD. Her father died when she was young, so that left just her and her mother Eutychia to fend for themselves. She had a decent dowry, but decided to give it to the poor. Her mother did not know of Lucy’s intentions and arranged for her to be married. Eutychia had been very ill with a bleeding disorder and made a pilgrimage to Catania, where there was a shrine for Saint Agatha. While there, St. Agatha came to Lucy in a dream and told her that because of her faith, her mother would be cured and that she would be a Saint. When others found out that Lucy was giving away her jewels and riches- the intended husband denounced her and reported this to Paschasius, the governer of Syracuse, Italy. Paschasius ordered her to pay for her sins by burning a sacrifice in the emperor’s image. When she refused, he sentenced her to be defiled at a brothel. HARSH. It is said that when the guards came to take her away, she could NOT be moved, no matter what they did- even when they hitched her to a team of oxen- Lucy could not move from where she sat. When they tried to burn her- she could not be burned. But alas, they stabbed her, which did kill the poor girl . One of the stories reports that she had been tortured by eye-gouging. They had her eyes removed before death, but when her body was being prepared for burial, her eyes had been miraculously restored. She is venerated as a Saint in the Catholic, Anglican, Lutheran and Orthodox churches. Her feast falls during advent on December 13th, coinciding with the Winter Solstice, so her feast day has become the “festival of light.” She is often depicted holding a cup or plate with eyes. 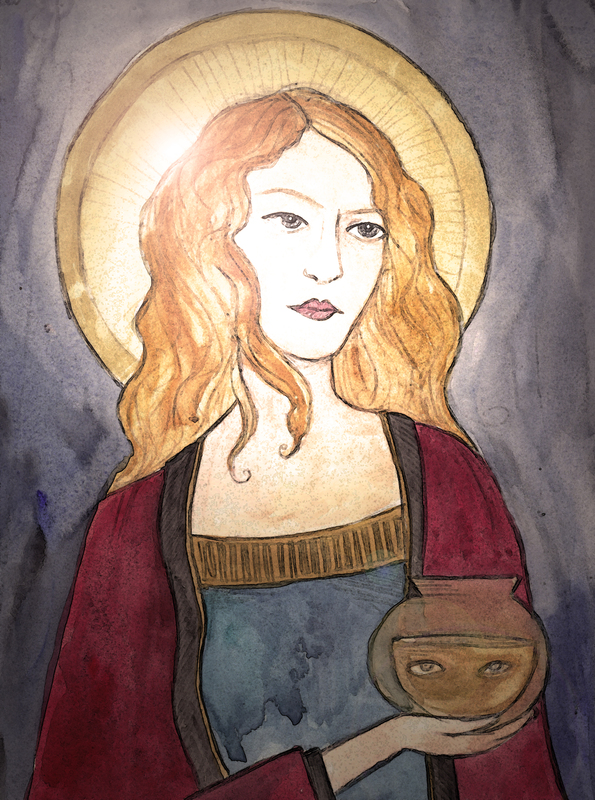 She is the patron Saint of the blind, martyrs, epidemics, throat infections and writers. Oh- and salesmen. weird. In Scandinavian countries, where the winters are so long and dark, Saint Lucia celebrations include young girls dressed in white, carrying palms and wearing a crown of candles. The white dressed represent martyrdom and the palms symbolize good over evil. Celebrating Saint Lucia is suppose to help one live through the long winter days with enough light. Of all the women I’ve been studying, THIS ONE should be a damn movie!! Drama, intrigue, travel, scandal, 8 languages, four husbands, a Mrs. Robinson thing… C’MON HOLLYWOOD! Lady Jane Elizabeth Digby (1807 – 1881) did it all, so to speak. Jane’s first husband was Edward Law, 2nd Baron of Ellenborough. They had one son who died in infancy. During this marriage, Jane had affairs with her cousin Colonel George Anson and Prince Felix Schwarzenberg. She had two children with Prince Felix (of Austria), Mathilde and Felix- who died just a few weeks after he was born. Eventually, a divorce was granted which caused considerable scandal for the times. Jane then started an affair with Ludwig of Bavaria but ended up marrying Bavarian Baron Karl von Vennigan out of convenience (this confuses me- how is it convenient to marry someone other than your boyfriend?) Her and Vennigan had a son- Heribert and a daughter Bertha. In 1838, she began an affair with Greek Count Spyridon Theotokis. 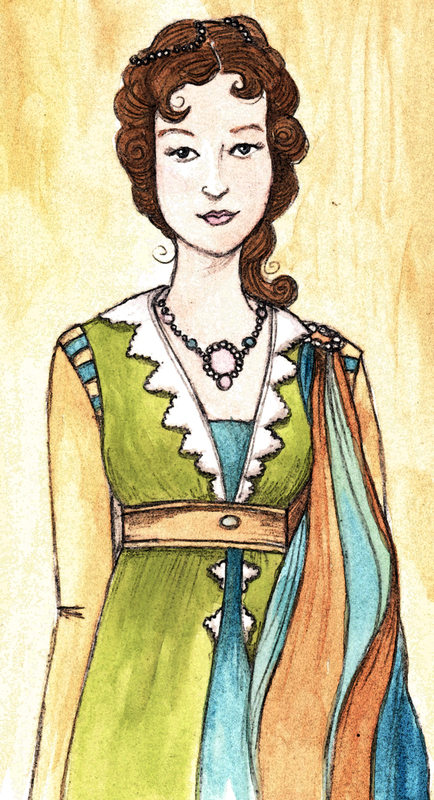 When her second husband- Vennigan found out, he challenged the Greek Count to a duel and lost. He kept the children and remained friendly with Jane until his death in 1874. I guess that’s where the “convenient” part kicks in. She was technically not divorced from Vennigan until 1842, but married Theotokis in 1841. Hmm. The couple had a son- Leonidas, who tragically fell off a balcony and died at the age of 6. They divorced soon after and she began seeing King Otto of Greece. There were many other affairs, but eventually, at the age of 46, Jane fell in love with Sheik Abul Medjuel el Mezrab of Syria. He was 20 years younger than Jane. They were married and she changed her name to Jane Elizabeth Digby el Mezrab. It was a very happy marriage that lasted until her death 28 years later. She went anywhere and everywhere with her 4th husband, living a nomadic lifestyle in tents across the desert. She did build a villa in Damascus, part of that home still stands today. Jane (who was sometimes called Jenny or Aurora) was said to be stunning, with a perfect figure and exquisite blue eyes and rose colored skin. This seemed to fuel the scandal and gossip generated by jealous women and jilted men. Books have been written, but apparently, they do not paint a flattering portrait of this woman. I think she is to be admired- she was not submissive and obedient. She was intelligent, well-traveled, and fluent in 8 languages. She did what she wanted- traveled, loved, explored, lived. I’ll be doing more reading on Mrs. Mezrab very soon. Cleopatra was the last pharaoh of Ancient Egypt- she ruled jointly with her father and later with her brothers- whom she married. Eventually, she ruled on her own after having a son with Julius Caesar- named Caesarion. She is well known for her affair with Mark Antony (she did marry him)- whom she had twins- Cleopatra Selene II and Alexander Helios. She also had a third child with Antony- Ptolemy Philadelphus. After Antony killed himself, Cleopatra did the same by having a cobra/asp bite her. (Surely there were better ways to go? no?) This was to avoid falling victim to the cruel Romans. She goes down in history as a great beauty, that used her sexuality to seduce the most powerful men during that time. Her sweet, charming voice, charm, and charisma caused men to swoon and do whatever she asked. At least that’s what the books tell us, the truth his- she was quite powerful on her own and did not need to use seduction to get what she wanted. Her rule was not altogether successful for her people. She taxed them heavily to pay her father’s debts, disregarded the country’s infrastructure, and only built one, self-serving temple dedicated to Julius Caesar. After her death at the age of 39, the Romans took control of Egypt. 1. She was not Egyptian. She was actually Macedonian/Greek. 2. She was one of 7 women that possessed the name Cleopatra during her dynasty- she was actually Cleopatra VII. Her full name was Cleopatra VII Thea Philopator. 3. She may have not only been the mistress of Julius Caesar, but also his wife. 4. She was a writer. She wrote a medical book titled Costmetics. But it was not about make-up, more about remedies for hair loss and dandruff. 5. She murdered her younger sister, and brother. This was not uncommon for ruling families during this time. 6. 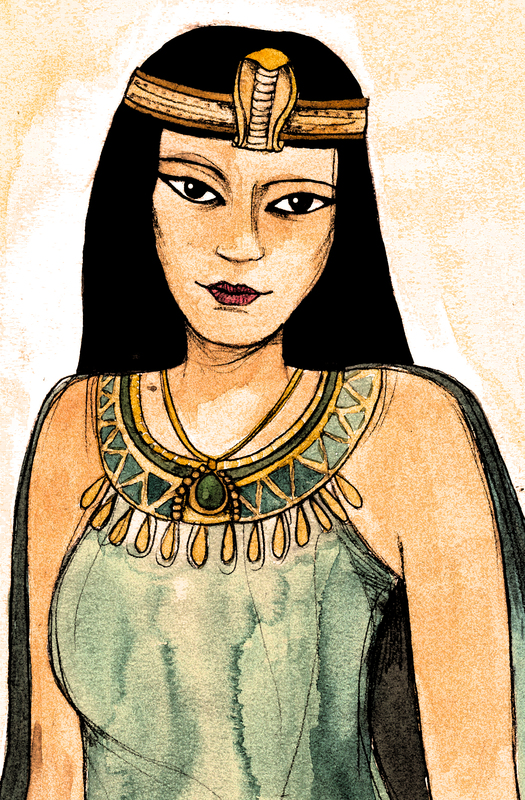 Only one of her four children survived into adulthood- Cleopatra Selene eventually became the Queen of Maurentania.